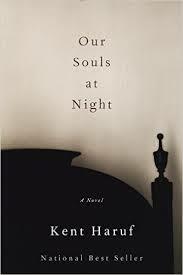 a book chick: "Our Souls at Night"
my take: I read this slim, quiet novel in two doses. It's the tender love story of two aging, widowed neighbors based on the author's own life. Set in a small Colorado town, Louis and Addie create quite a stir in their little world and in their families. The nights spent baring their souls to each other warmed my heart and make me want to believe that at any age we can find solace and renewed life in/with our fellow humans. I was surprised by the ending having read the story behind the story. You decide which order you want to have it revealed: real life story first or after.